iCreate@ our 1,000 square metre open plan digital creative zone. Barking & Dagenham College is a rapidly expanding college with a vision to be ‘A Truly Great College – Passionate about Success’. The College’s mission: To be outstanding in Education, Training and Partnerships. Since 2008, the College has worked with local partners and responded to local population growth and LMI training demands, with resultant student numbers growing by approximately 20%, in a borough with the cheapest residential accommodation in London, and where the demographic trend is upwards. Excellence is at the heart of their mission and further investment was required to create and enhance industry standard training spaces, to support the drive to deliver outstanding technical and vocational provision across all departments. The Gazelle STEM Centre represents a departure from traditional classroom design to a more flexible approach, where spaces can be used for a variety of teaching styles and age groups. BDC’s regional Gazelle STEM Centre can be used independently from the Jubilee Building, allowing local schools to benefit from its facilities. 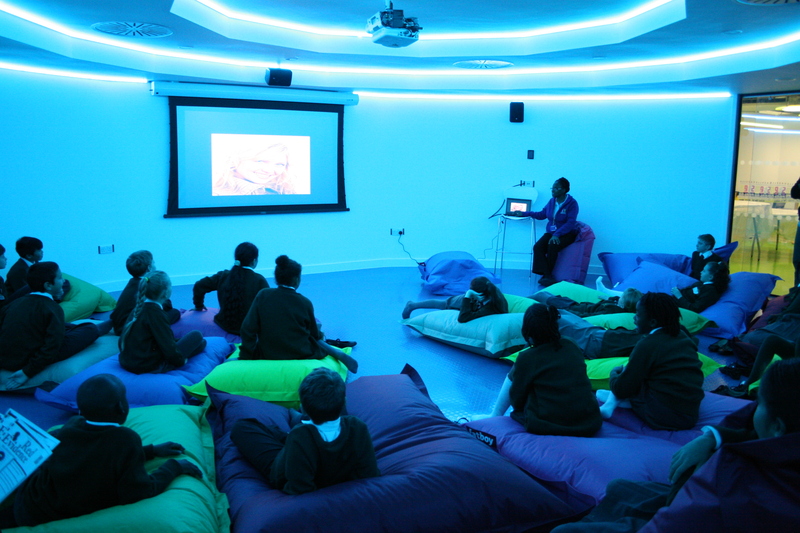 The Centre’s stimulating setting allows learning to take place in a fun, engaging and creative environment. The project included a total of 1,383m2 of new build and c. 3,100m2 of refurbishment. The project costs were £875,000 with funding being secured from the Skills Funding Agency Grant, a bank loan and the Colleges own resources. Work began on site in April 2012 and was completed 18 months later in October 2013. Within the London Borough of Barking and Dagenham, there is an urgent demand to respond to increasing numbers of disengaged, Not in Education, Employment or Training (NEETS) students (6.9%). Aspirations in the borough are low, which is closely linked to the latest report on child poverty which shows that 38% of young people are in households receiving less than 60% of median income. However, since 2008, the College has worked with local partners and responded to local population growth and LMI training demands, with resultant student numbers growing by approximately 20% (including a 13% increase in 16-18 student numbers) over the last 4 years. In addition, apprenticeship delivery has doubled over the last 2 years for Adults; whilst 16 to 18 Apprenticeships has grown by 32% over the same period. The predicted growth for the next period shows a further increase of 20%. Yet before development this part of the campus was Category D; significantly aged, energy inefficient, dilapidated, contained asbestos, provided unacceptable training environments due to poor light, lack of heating and ventilation, was inaccessible for people with physical disabilities and of the poorest quality across the campus. The area also housed an aged plumbing and a carpentry workshop, a training kitchen and 4 classrooms. The accommodation visibly failed to support the delivery of the College’s aspirational strategic objectives or to raise the aspirations and aims of the young people within the borough. In order to develop the facilities to meet the Colleges vision to be a vision to be a ‘Truly Great College – Passionate about Success’, the management developed a comprehensive Property Strategy. This phased development broke down the whole scheme into deliverable, incremental projects, intended to renew and modernise the ageing estate, rationalising it and thereby making it more efficient, where possible. In addition, the intention was to enhance further the technical training facilities within the curriculum, and to inspire and transform the teaching and learning experiences within these facilities.
) To replace our existing Category D, 1960s “B Block” workshops and classrooms (2,317m2 of property) located adjacent and to the rear of “A Block”, as well as to the rear of our new Jubilee Building Block (currently under construction following a successful ERG2 application) with 1,383m2 of new workshops of sustainable classrooms and workshops. The STEM Centre project was part of the wider strategic development plan, developed by the College. 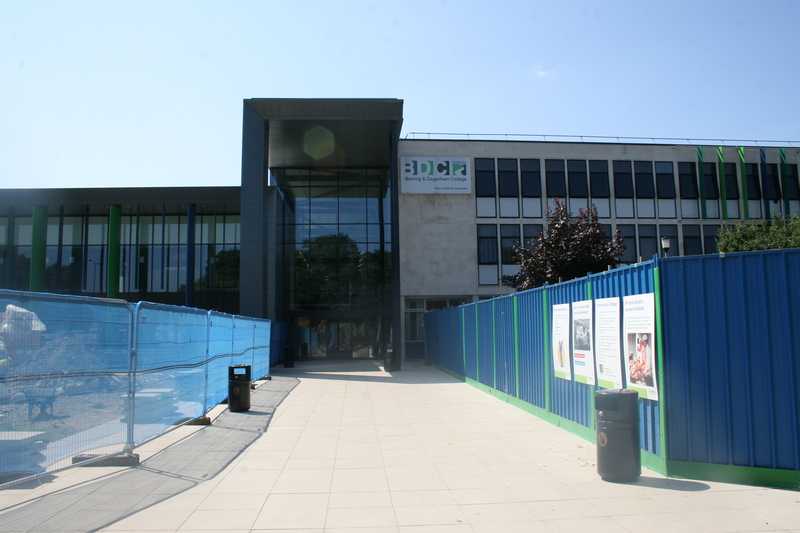 Overall, the College was undertaking a £13m capital programme to improve and extend the campus. This project, which cost £875,000 was undertaken as a discreet element of that programme. The programme saw the development of additional teaching and learning space on an existing College car parking area, a new road frontage and a significant upgrade of existing buildings. The programme was developed to enable the College to align with the London Enterprise Partnership (LEP) and other strategic objectives, while providing the College with new and improved facilities. The College developed an ambitious estate development strategy, which was broken down into clear and definable ‘stages’. This enabled them to deliver the strategy in a series of ‘bite-sized chunks’, with each of these stages being well controlled, in terms of both funding and financing and operational management. The new facilities provide additional capacity and have replaced existing curriculum areas which were no longer fit for purpose. The new areas include a double height Learning & Resource Centre (LRC), new bakery, ‘Chef’s Hat’ restaurant with associated kitchen, coffee shop, training kitchen, retail training outlets and a plumbing and electrical workshop. The Jubilee building includes a state of the art science, technology, english & maths facility, known as a ‘STEM’ building and which was the first in the Country. All works were undertaken whilst the College remained fully operational. Each phase of the project was developed with its own ‘key-stage’ business plan, which identified funding and financing and a clear business case. The delivery of each strand was then led by the College senior leadership team, who maintained close monitoring and management of both the build programme and cost-control. The provision of enhanced STEM facilities was inspired by the experiences and outcomes of another college, South West College in Belfast. Communication news of the development: one of a series of information posters used to communicate the estate programme to students and staff. The initial design brief was subject to a design competition, for which students were invited to submit ideas for how the development might look and the types of facilities and functions that the project could deliver. The winning student then worked, alongside staff and the appointed architect, in the development of that concept into a formal design brief. The new campus would provide extra teaching and learning space, improved facilities and a brand new welcoming frontage for the College, significantly enhancing the perception of the College with local students and residents. At this stage, the College undertook significant stakeholder consultation, hosting a 3-day public consultation event where local residents, council representatives and employers were invited to participate in presentations and workshops. Stakeholder and local community consultation was led by the College, with the senior leadership team taking a central, day to day involvement at all stages of the project development. The College went to great lengths to work with the local community, ensuring that the views of local residents were taken into account and that any disruption to local services was mitigated as much as possible. For example, delivery times for materials and contractors was restricted and provision for additional on-site parking was made to minimise any impact on local amenities. The result was that the project had significant support from the local community, who have remained engaged with the College in other areas of development. In addition, the enhancement of the College is reported to have had a positive impact on local house prices, with the new campus providing a ‘destination’ and enhanced local amenities, some of which are available to local residents. The project required detailed planning and the College worked closely with the local planning authority to ensure that the planning process ran efficiently. The College appointed a number of Strategic Leadership Team members to various aspects of project delivery. Each project was closely scrutinised by both the SMT and the Board of Governors to ensure transparency and to optimise control of the project by the College. The College undertook a number of consultation and process management activities to ensure that the STEM centre, which was part of a larger project delivered at the same time, could be delivered on time, on budget and with the minimum disruption. The Senior Management Team believed it was essential that the College was in control of every aspect of the project. Therefore whilst the College engaged an external consultant to act as project manager and a professional team to deliver the project, the Vice-principal Resources and the Head of Estates of the College were fully involved to ensure the construction remained on time and on budget. Since September 2014 the Centre is also home to the Siemens Mechatronics Academy which has been developed thanks to grant from the Edge Foundation. As stated the Gazelle STEM Centre build takes place within the Jubilee Building creating an overall facility that provides a double height Learning Resource Centre which is open to the public, the College’s main reception, advice street offering a range of student services, an art gallery space, a math’s and english hub, a plumbing academy and executive suite offices. Students benefit from new industry-standard workshops and training spaces, including kitchens where trainee chefs and bakers prepare dishes for paying customers of the Chef’s Hat, the on-campus commercial restaurant, and for sale in the adjacent café. Student Enterprise Outlets are located along the main façade, designed to accommodate student owned micro ‘pop-up’ businesses to help promote entrepreneurial opportunities within the College and complement the local area’s business offer. With significant “curb appeal” the project has transformed the College’s Rush Green Campus, creating an impressive and vibrant frontage that draws students and visitors into an open and airy entrance way where light streams in. Externally, a series of brightly coloured vertical fins unite the existing public face with the new build, presenting a more transparent façade that showcases student work and activities to the wider community. At night these fins are illuminated to provide a distinctive and welcoming environment. The project was delivered to time and to budget, with each stage of the project being very carefully planned by the College and their professional delivery support providers. As a result, disruption (to both learners and local residents) was kept to an absolute minimum, with temporary accommodation being provided by a series of temporary classrooms that were located on campus. The College benefits from having a large campus estate (28.5 acres) and the whole campus was used to ensure that adequate temporary space was provided, with clear signage and temporary ‘walkways’ being provided as part of the plan. The project was delivered on time and according to the programme, with no delay in teaching and learning provision. A clear decant and migration strategy was put in place and College staff and learners were informed of progress by means of weekly bulletins and monthly updates. In addition, the Board of Governors were given updates on progress at each corporation meeting. Post construction assessment was conducted by the College and a clear snagging brief developed. This was agreed with the contractors at an early stage and the delivery of snagging works was also closely monitored and managed by the College’s Strategic Leadership team. The regional Gazelle STEM (Science, Technology, Engineering & Maths) Centre at Barking & Dagenham College (BDC) was officially opened in October 2013 by Carol Vorderman MBE, in the presence of invited guests including David Wilson, Deputy Director at the Department for Business, Innovation and Skills. These activity days are already proving popular with those young people that have had the opportunity to experience them. 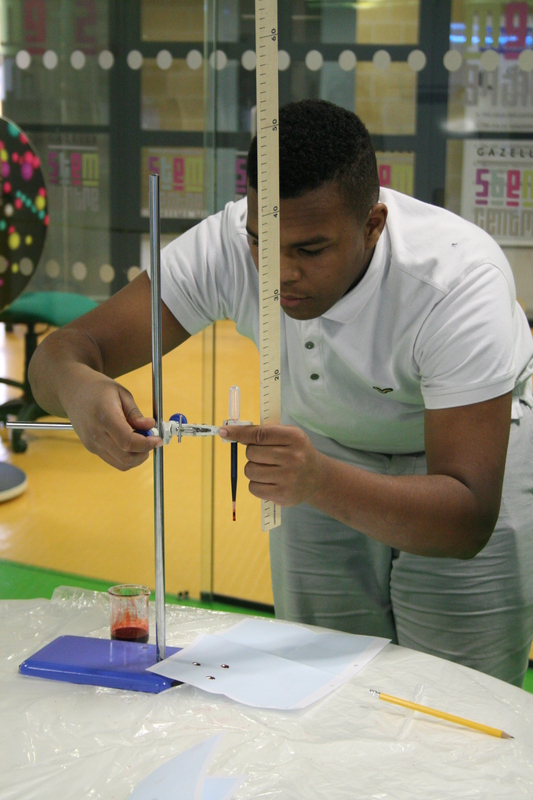 “The STEM Centre contributed towards my learning through the CSI activities which demonstrated real actions undertaken in a real crime scene by the relevant authorities. This was very useful for me in regards to my Criminal Law unit where we have to look at number of different cases and determine the criminal liability of the people involved in it. We look at laws and regulations used to prevent crimes but we have never looked at the real side of a crime scene so now I feel much more confident about that as I have also improved on specific terms and words to use for my assessment. The session also made me realise that it is important to have skills in Science, Maths and Technology as it is needed to some extent even in a subject like Law. “The Siemens’ Mechatronics Academy has been co-created with the company as one strand of the College’s STEM strategy, to meet the London and Thames Gateway economic and workforce development needs. The College are very proud of the outcomes achieved by the estate enhancement programme, with all key teaching and learning outcomes being achieved. Despite this, the College recognised that the planning of the delivery of teaching and learning and the management of on-site learner experience (during the build phase) could still be improved. However, this is with the benefit of hindsight and the significant experience gained by the Senior Management Team and curriculum staff, as a consequence of this project. In summary, the programme has been a huge success and has made a positive difference to the provision of teaching and learning and access to skills for local learners. In addition, the project has significantly enhanced the relationship between the College, the local community and an increasing number of employers, all of which contribute to better opportunities for the people of Barking & Dagenham.